Shrug Jacket - Kate Middleton fans loved the sophisticated look on her wedding day, and we do too. Simple, yet sensational, the shrug jacket that the Duchess of Cambridge paired with the strapless wedding dress that she wore to her reception complimented her silk gown perfectly. A popular choice for today's fashion forward brides, a shrug, often called a topper, bolero, jacket, or cape is a simple yet chic accessory that can take a wedding dress from boring and bland to breathtaking in a heartbeat. Love the look but not sure which of the stunning styles is right for your wedding gown? Read on as we reveal the fundamentals of choosing a shrug - and how to nail this exciting look. You’ve had your heart set on the perfect strapless wedding dress for ages and really want to make a fashion statement on your wedding day. Now what? From sophisticated sheer lace shrugs and wraps to delicately detailed toppers and dramatic full length capes, bridal cover ups are available in a multitude of styles and fabrics to accommodate virtually every wedding dress and style preference imaginable. First, you’ll need to consider the style and fabric of the gown that you’ve chosen. Is it smooth, sleek and modern; a minimalist design? 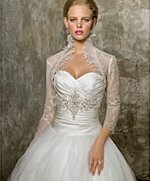 Or, is it more of a traditional style with lots of lace, bows, and intricate details? For frilly, lace, or intricate wedding apparel with a lot of detailing, opt for a topper or jacket that enhances and complements the dress. Look for simple, classic styles in silk, satin or even sheer materials that don’t compete for attention. For wedding dresses that are sleek or a minimalist design, consider a contrasting shrug in a delicate lace that will add to the dress. Popular styles with a chic twist include jackets with a sheen, sparkle, pearls, or gold thread. And, for brides who love a dramatic flare, full length capes can be breathtaking too. It's important to keep in mind that your choice will also depend on the climate and time of year that you’re getting married. Remember to KISS - keep it simple. During the summer months and in warmer, sunny climates like California, Hawaii and Florida, brides tend to opt for shrugs in lightweight pretty lace or fine mesh in short or 3/4 sleeve length. For winter weddings and colder climates, brides prefer longer sleeves for more coverage. Popular choices include angora (like the Duchess of Cambridge), silk, lace, satin, and super luxurious fur. Beautiful Lingerie Tip - When choosing a shrug jacket, it's important not to mix different lace styles. Why? Too many laces are too busy and will confuse the eye - a look that you'll chastise yourself about years later when you're looking at your bridal photos. No matter which style of wedding dress, any bride can create a gorgeous look with a well chosen shrug, jacket, cape or topper in the perfect color. Think that white is the only option? Think again. Let these exciting picks shape your silhouette for a stunning wedding day look that all your friends will envy. Pastels - soft and feminine pastel shades like champagne and ice are the classic choice for traditional brides who prefer an elegant look and feel. Sheer lace and mesh shrugs in creamy shades of white, eggshell, pale silver, and soft blush tones offer a demure and sophisticated look that’s designed to dazzle. Bright and bold - daring colors like rose, horizon blue, sangria, and yes, even black are sought after by fashionistas who love to push the style envelope while making a dramatic entrance. Metallics - for the bride who craves a touch of understated luxury that makes you look twice. A touch of glamorous gold, shimmering silver, rose gold, or elegant beading complement any wedding dress with an extra glow of sophistication.